The Blombos Cave drawing -- made with ochre pencil on silcrete stone -- is the first drawing made by a human, scientists say. Your college art history textbook needs a new first chapter. 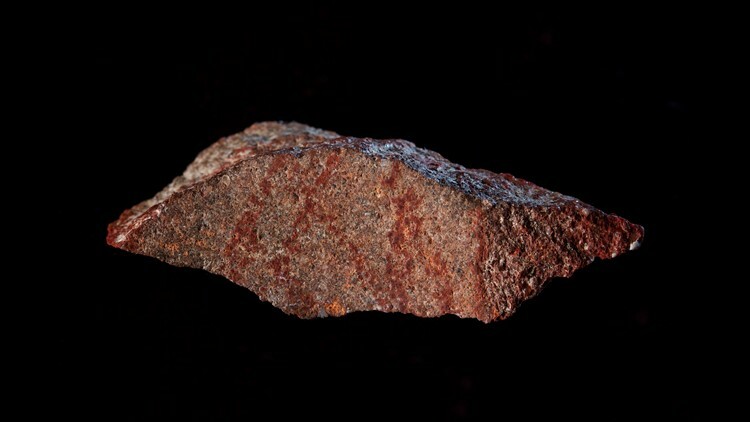 The earliest known drawing in human history – a red, cross-hatched pattern that looks somewhat like a hashtag – has been unearthed on a rock in South Africa, reports a new study published this week in the journal Nature. The 73,000-year-old drawing predates previously discovered abstract and figurative drawings elsewhere by at least 30,000 years, the study said. Scientists believe that a human intentionally and deliberately drew the lines on a small rock fragment known as a flake. "Our microscopic and chemical analyses of the pattern confirm that red ochre pigment was intentionally applied to the flake with an ochre 'crayon'," the study said. Based on experiments recreating the pattern, the authors conclude that the "crayon" had a tip about 1 to 3 millimeters in width. That the ancient artist chose to sketch with red ochre isn't a surprise, according to an accompanying editorial in Nature. "The mineral, largely consisting of iron oxide, has been used as a pigment since time immemorial," the editorial said. 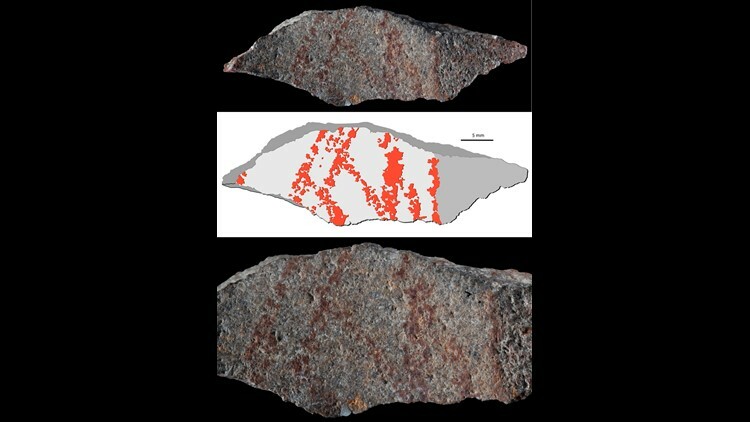 The findings also show how early Homo sapiens in southern Africa made graphic designs in various media, using different techniques. A rock displays a drawing made up of nine lines traced on one of its faces with an ocher implement. The middle image more clearly shows the pattern that was drawn on the rock. "Before this discovery, Palaeolithic archaeologists have for a long time been convinced that unambiguous symbols first appeared when Homo sapiens entered Europe, about 40,000 years ago, and later replaced local Neanderthals," said study lead author Christopher Henshilwood, a University of Bergen archaeologist, in a statement. However, he said that "recent archaeological discoveries in Africa, Europe and Asia, in which members of our team have often participated, support a much earlier emergence for the production and use of symbols." The rock was discovered in Blombos Cave near the southern tip of South Africa, east of Cape Town. It's a site that contains some of the earliest known evidence of modern human cultural activity. The editorial in Nature also said that "we cannot know why they made the marks, or what they represent; unlike images of animals or hands, the drawing’s abstract nature offers no clues." However, it adds that since the early Homo sapiens were able to produce such designs, it suggests they possessed relatively "modern" cognition and behavior. In a statement, study lead author Henshilwood concluded that "the drawing adds a completely new dimension to our ability to understand when early humans became like us."